Interstate 65 used to have a business loop in Lebanon, Indiana. Coincidentally, Lebanon, Missouri is also home to a business loop for I-44, while Lebanon, New Hampshire previously posted one for I-89. U.S. 52 split between a mainline and bypass route at Lebanon by the early 1950s. The pre-freeway bypass became part of the alignment for Interstate 65 in 1959, with U.S. 52 relocated away from the city. According to Michael King, the former route of U.S. 52 along Lafayette Avenue through Lebanon was posted as Business Loop I-65. 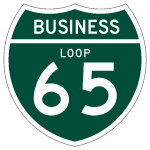 Jacob Newkirk added that Business Loop I-65 was posted with signs dating from circa 1960. These were removed by 1995 or earlier. The general route traveled north along Indianapolis Avenue with U.S. 52 Business from Exit 138. Indiana 32 combined with the business loop from Spencer Avenue north to South Street. One block further, Business Loop I-65 turned west onto Main Street west, where U.S. 52 was once marked with an outline shield. Business Loop I-65 north & U.S. 52 Business lined Main Street west across Indiana 39 (Lebanon Street) to Lafayette Avenue. All of the old U.S. 52 signs posted along this stretch were smaller cutouts including the state name. Lafayette Avenue returned the routes to Interstate 65 at back to back wye interchanges (Exit 141) where U.S. 52 split to the northwest. Indiana state maps and Indianapolis vicinity maps from Gousha, Rand McNally, and INDOT omitted the business route.